Antarctic krill regularly feed on the seabed, scientists have found. Until now the tiny crustaceans were thought to live mainly near the ocean surface. Krill are incredibly numerous and form a vital link in the marine food chain. The discovery isn't just an important breakthrough in understanding their behaviour and ecology, though; it also suggests a possible new mechanism by which nutrients are transported between sea surface and sea floor. On average, between two and 20 per cent of krill are at the sea floor or on the way there or back, the scientists think. And in some areas, as much as 40-45 per cent of krill were on the bottom and 70 per cent were deeper than 200 meters. That's a huge change in our view of krill behavior. And because until now researchers have estimated their numbers using data from just the top 200m of water, there could be a lot more of them about than we've realised. "It's a big surprise, because until now krill have always been thought of as a species of the upper ocean," says Dr. Katrin Schmidt, a krill ecologist at the British Antarctic Survey (BAS) and lead author of the paper, which is published in Limnology and Oceanography. Scientists knew the occasional individual turned up in deep water, but never suspected it was standard practice. 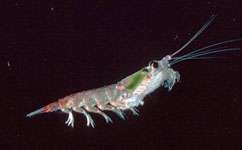 The krill may be moving deeper because climate change is making the surface waters too warm for comfort, Schmidt suggests. This would be an alternative to moving south in search of colder conditions. To test how flexible krill really are in changing their behavior due to climate change, scientists need to conduct more of these deep surveys. Percentage of krill population found at different depths. The paper's authors drew on data on krill catches using nets at different depths, as well as sonar readings, to estimate krill numbers. They also took pictures of the seabed environment with a towed camera. Their results suggest that by eating the mulch of rotting organic matter on the seabed and then returning to shallow waters, krill are bringing significant amounts of iron up from the depths in their stomachs. Examining the stomach contents of the krill confirmed this  one had as much as 260 nanomoles of iron in its stomach. If the team's estimates are accurate, krill could be bringing up to 76 nanomoles of iron per square metre into the upper ocean every day. This is in a form usable to phytoplankton  the microscopic algae that live near the ocean's surface and form the bottom rung of the marine food chain by turning sunlight into energy through photosynthesis. It's a very substantial input, given that well-known sources like currents welling up from the depths and wind-blown dust are thought to contribute between 4 and 145 nanomoles per square meter per day. Iron is a vital nutrient for phytoplankton, whose growth is often limited by the availability of iron and other nutrients; this happens because as soon as something dies here, it sinks down into deeper water and its nutrients are lost from the shallow-water ecosystem. This is also why it's worthwhile for krill to make a long downward trek; the seabed is covered with nutritious decaying organic matter and the scavenging animals that eat it. Individual krill are small  just a few centimetres long  but taken as a whole they represent a huge store of living matter. Those in the Antarctic alone have a total mass of between 100 and 500 million tonnes  more than every human on the planet. Krill provide food for everything from fish and penguins to whales. They are also fished by several nations, and this fishing pressure is likely to increase as other food species' numbers fall due to overexploitation and environmental change. If we don't plan future fishing carefully, the other animals that depend on krill could be squeezed out.